Review: The first clan to lack a Trumpeter clone, Oracle Think Tank is no worse off for it. 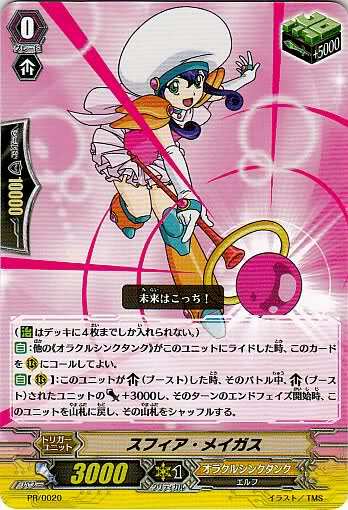 Lozenge Magus and Sphere Magus are like Battleraizer, cycling triggers that move to rearguard circles when ridden over. The difference being, these are heal triggers, making them by default required in a deck. As such, even for a deck that chooses not to run them as the starter, these two are essential to all Oracle Think Tank decks. Restating my position on Battleraizer, these cards are a form of hand conservation. Lozenge/Sphere comes from “nowhere,” taking nothing away from your hand and instead giving you a free unit. When compared to the likes of Stardust Trumpeter, Undeux and Kaleido Ace, you will generally call one less unit because you are gaining one automatically, removing the pressure from your hand. Despite sharing the ability and benefits Battleraizer came with, Lozenge and Sphere are not the decisive starters for Oracle Think Tank. The alternative is an attractive, if somewhat risky card that keeps one's hand even more closely guarded than Lozenge. 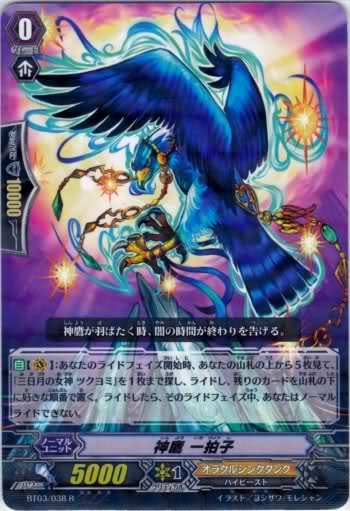 Godhawk, Ichibyoshi searches out the top five cards of your deck at the start of your ride phase, and if Goddess of the Crescent Moon, Tsukuyomi is present in those five cards, he superior rides her from the deck. Likewise, the Crescent and Half Moon forms of Tsukuyomi each search out the top five cards in an identical fashion, for their corresponding higher-grade counterparts. Because all forms of Tsukuyomi are ridden from the deck, this protects the player from having to pay the cost of riding. In a Lozenge-style ride line(Lozenge Magus → Oracle Guardian, Gemini → Oracle Guardian, Wiseman → CEO Amaterasu) the hand at the end of the third turn is 9 cards, but in an Ichibyoshi-style ride line(Godhawk, Ichibyoshi → Goddess of the Crescent Moon, Tsukuyomi → Goddess of the Half Moon, Tsukuyomi → Goddess of the Full Moon, Tsukuyomi) the hand at the end of the third turn is ten, a one card advantage over Lozenge-style riding. This may seem insignificant, but that one card is one more card to guard with, or one more unit to call, which is invaluable regardless of the situation. This method of riding comes with serious drawbacks. Each form of Tsukuyomi is weaker than standard units of similar grade, and her final form is overall weakened by the lack of other Tsuyomi cards in the soul. Missing a ride using the Godhawk as one's starter is even more painful than missing a ride using Lozenge. One thing I did not cover when discussing this previously was the number of cards from the Godhawk line necessary to ensure a superior ride. 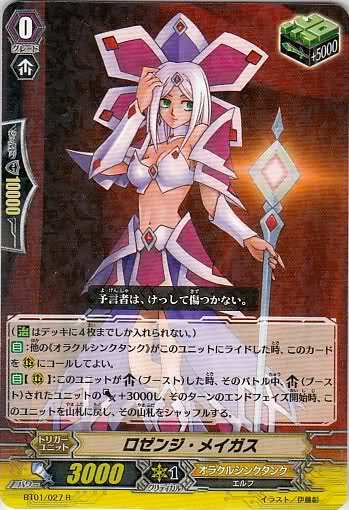 While the only championship decklist to currently use a similar line(Gallahad instead of Tsukuyomi) did not follow the line up to its final form, it did use a ratio of 1:4:4 reading from grades 0-2. I would support this take, due to the sheer difficulty in riding, though current Vanguard simulation programs(Byond et al.) are not necessarily accurate for gathering data on this matter, due to fundamental problems in their shuffler. Mathematically your chance of riding increases as you continue to successfully superior ride, from a 46.51% chance on the first turn to 47.61% chance on the second and a full 50% on the third if you run four of each form of Tsukuyomi. For its hand security and overall higher chance of making a successful ride each turn, I would choose Godhawk, Ichibyoshi over Lozenge Magus. Next time I'll be covering Megacolony.